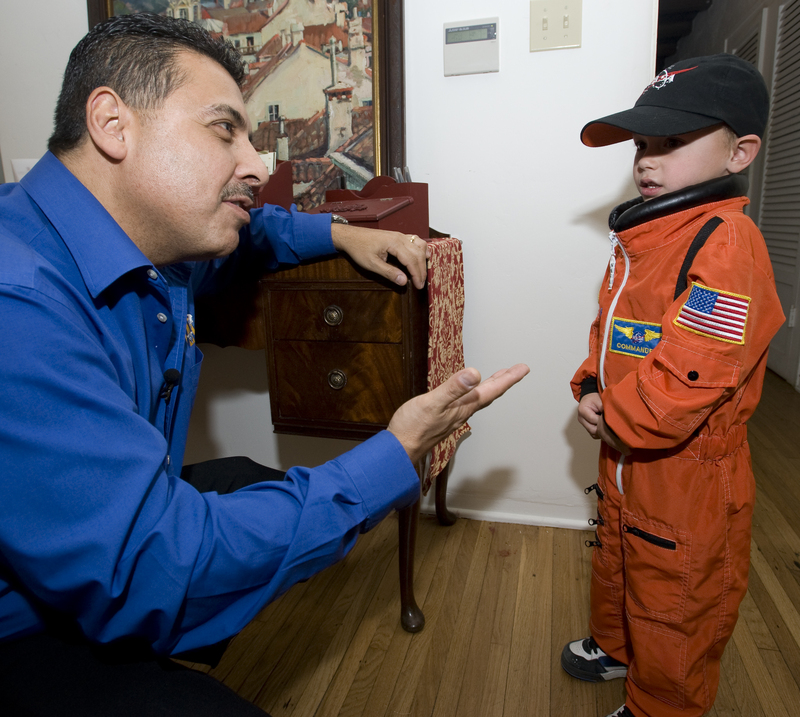 Former Shuttle Astronaut Jose Hernandez speaks with the future. SAN CLEMENTE –(CA)- You might not often make a connection between sweets and space, but 11-year-old Mikaela Bellomo of San Clemente says she’s more determined than ever to one day open a candy shop after hearing former astronaut Jose Hernandez speak at Casa Romantica Cultural Center and Gardens. “You can be anything you want, but the key is an education,” Hernandez said Monday afternoon to about 200 local residents, including 60 children from the Boys & Girls Club. Hernandez detailed his 2009 mission aboard thespace shuttle Discovery, spending 14 days circling the Earth every 90 minutes and traveling more than 5.7 million miles. The mission was to deliver 18,000 pounds of supplies and equipment to the International Space Station and collect and put in place several experiments. 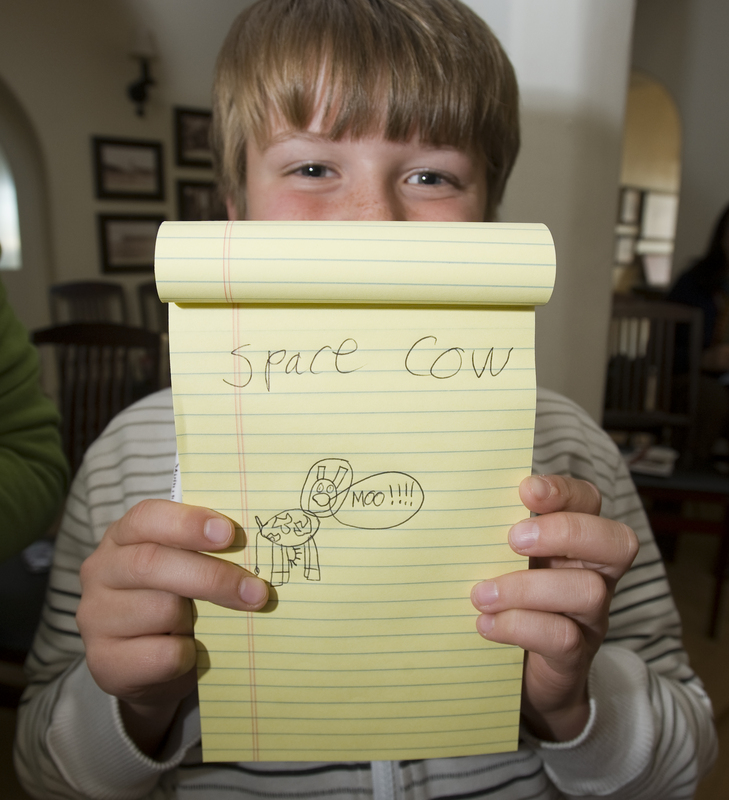 Young artist with his Space Cow. Hernandez also spoke about his early childhood as the son of migrant farmworkers in California’s Central Valley. He started working in the fields early each morning alongside his parents, brothers and sisters, picking fruit and vegetables. It was still dark outside, and Hernandez would look up to the stars and the moon. He decided at 8 years old that one day he would be an astronaut. But due to the nature of migrant work and traveling a lot, it was hard to attend school consistently, he said. Each year, his family returned after the picking season to their home in Mexico for three months or more, making it difficult to stay proficient in English. Hernandez reached a turning point when a teacher went to where he and his family were living, near his birthplace of French Camp, to talk about the importance of education. His parents spoke no English and the teacher spoke no Spanish, so it was up to Hernandez to interpret. His parents encouraged him to follow his dream, he said, saying he could do anything he set his mind to. Hernandez showed Monday’s audience a 20-minute video of his Discovery mission. Then he accepted a $5,000 check for his charitable foundation, Reaching for the Stars, from Dr. Ronald Redmond, a local dentist who sponsored the event. Hernandez took time for pictures, autographs and words of encouragement for the eager kids surrounding him, including Cara Kitts, 12, a San Clemente resident who aims to be an engineer.